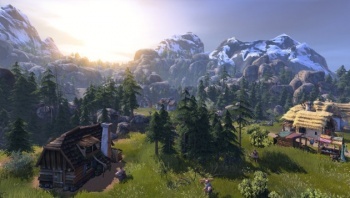 The Settlers 7 DRM woes apparently remain unsettled, as many users are still reporting difficulties connecting to Ubisoft's servers weeks after the game's release. The Settlers series may not be as high-profile as Assassin's Creed, but it's a long-running franchise with a solid fanbase, and the bottom line is this: When a man wants to play his videogame, he wants to play his videogame. Unfortunately, that's apparently still a problem for a lot of Settlers 7 owners, who are reportedly still struggling with Ubisoft's always-on internet requirement. At the end of March it came to light that gamers in Australia had been unable to play for a week because of issues with the DRM servers. Ubisoft assured everyone that it was trying to figure things out but apparently it's not having much luck on that front, because the company told Eurogamer today that the servers are still choking out. "Settlers 7 players have encountered difficulties playing the game over the [Easter] holiday weekend due to issues with servers that do matchmaking in multiplayer mode and that keep track of profiles, campaign progression and stats in both solo and multi modes," Ubisoft said. "Our technical teams have made progress but we are not yet able to say that the issue is completely resolved." Ubisoft has promised to post updates as they become available in the official Settlers 7 forum, available here.